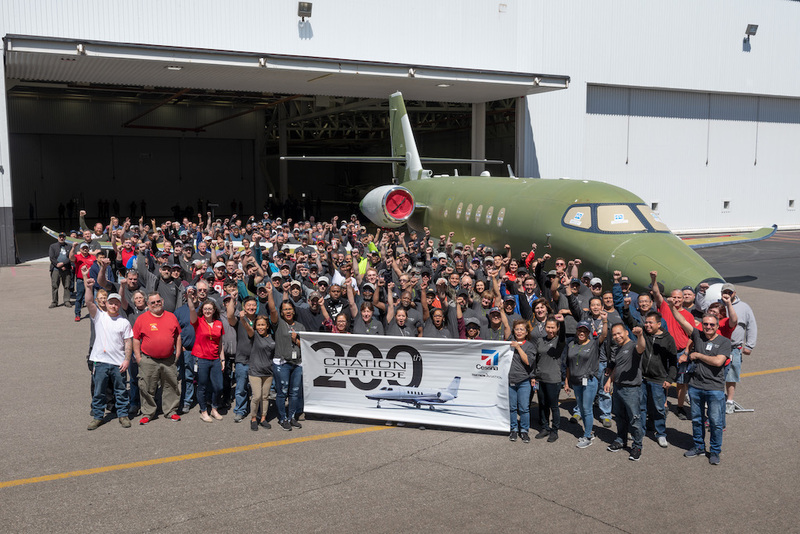 Textron Aviation has produced its 200th Cessna Citation Latitude midsize jet and recently marked the milestone with its employees at a special ceremony at the company’s Wichita plant, the OEM announced Monday. Fractional aircraft provider NetJets will take delivery of this milestone midsize jet later this year. The model has led Textron Aviation’s Citation jet deliveries for the past three years, and the Latitude fleet has accumulated more than 150,000 flight hours since its entry into service in third quarter 2015. It has since been certified in 43 countries. Textron Aviation has a Citation Latitude on static display at this week at ABACE 2019. With a flat floor and cabin height of six feet, the Pratt & Whitney Canada PW306D1-powered twinjet has seating for up to nine passengers. With four passengers, the $17.3 million Latitude has a range of 2,700 nm at its 446-knot high-speed cruise. NetJets is among the Latitude’s largest customers, with firm orders and options for up to 200 of the type. As of 2018, Textron Aviation has delivered 80 Latitudes to NetJets, according to the airframer.